From the Adelaide CBD, take the Main North Road( Sturt Highway)through the city of Elizabeth to the outskirts of the town of Gawler. Follow the by-pass around Gawler, continue on the Sturt Highway towards the Riverland and Nuriootpa. Take the outlet to the town of Nuriootpa. At the southern end of the town ( one main commercial street) is a T- Junction near the old Tolley still house. Directions here point to Angaston. Approximately 4kms from the T-junction on the left-hand side of the road is the driveway to Strathlyn B & B , marked by signs and a stone entrance. It has rural numbering 407. Strathlyn Estate offers the best of three worlds for couples: the charm of the Coach House; the space of the Lemon Tree Spa apartment and traditional in-house bed and breakfast for lovers of hosted accommodation. 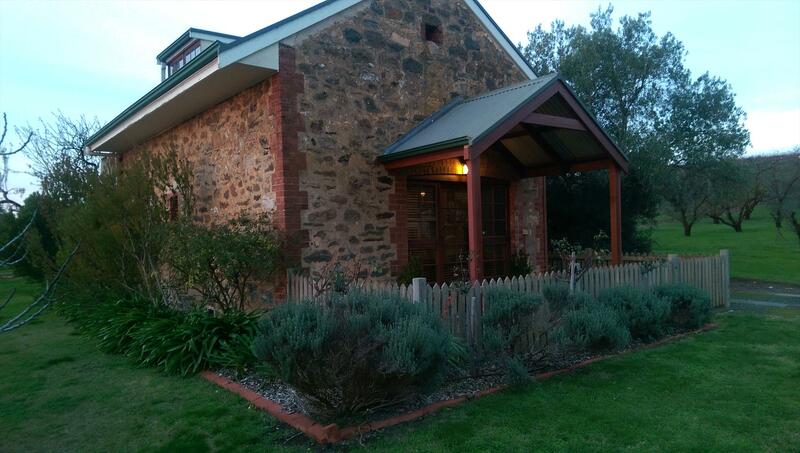 Strathlyn Bed and Breakfast at Angaston in the Barossa wine region of South Australia offers unique and varied accommodation options for couples. Choose from private, self-contained accommodation in the historic blue stone Coach House or in the Lemon Tree Spa Apartment. You may prefer the intimacy and indulgence of the two Spa Garden Suites where every comfort is provided including a tasty breakfast tray served to your suite at a nominated time. Situated next to Saltram Wine Estate, within walking distance of Salters Restaurant and only 750 metres from Vintners Bar and Grill, Strathlyn Bed and Breakfast is an ideal location in which to experience the changing seasons. Spend one day or several in a peaceful secluded setting of gardens and vineyards with panoramic views of the valley from the western boundary. Enjoy a glass of wine as you watch the setting sun from your private balcony or garden setting. Take advantage of the new gymnasium for guests as well as the guest laundry if you are on an extended trip. 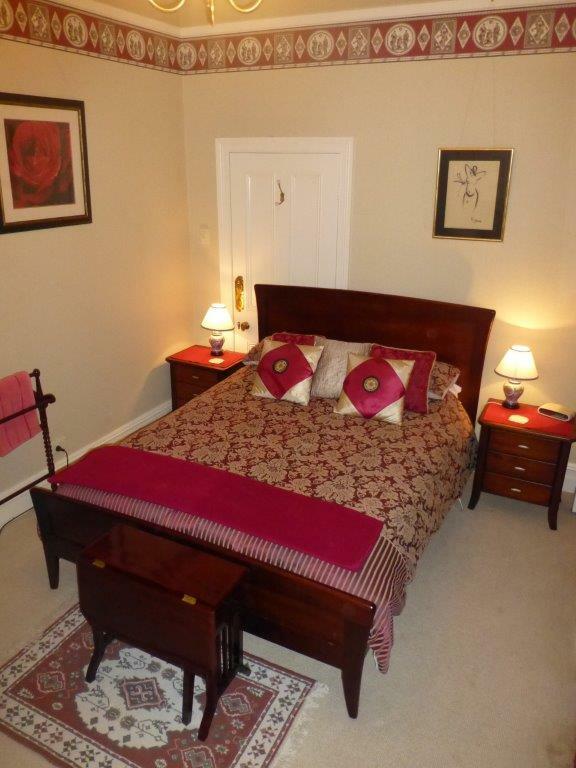 1 Queen Bed upstairs with separate bathroom with bath, shower and vanity. Toilet in separate room. Electric blanket on bed available. Two gowns and slippers for guests comfort. Country style breakfast provisions to self prepare. Sink, microwave, double hot plate and refrigerator in kitchenette. 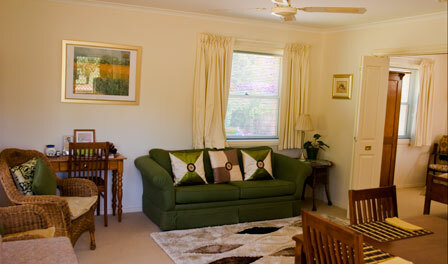 A/C, ceiling fan, electric log fire and convection heater provided. Hair dryer, bathroom toiletries, towels and linen included. Magazines, novels, videos and DVDs for guests use. Balcony with views of vineyard and ranges across the valley. Table and two outdoor chairs on balcony. Living area downstairs with TV and DVD/VCR. Queen bed with electric blanket. Separate bathroom with shower, toilet and vanity. Large two person spa bath in tiled section attached to bedroom. Gowns and slippers for guests comfort. Linen , towels, bathroom toiletries supplied. Living area with TV/DVD/ VCR, magazines, dvds and selection of books. Small writing desk. RC air.con, two ceiling fans, heating in spa area as well as convection heater. Kitchenette with sink, refrigerator, double hot-plate, microwave, dining table and chairs. Outside table setting in walled area.Pond, large trees and gardens nearby. Country style breakfast provisions provided to self prepare. 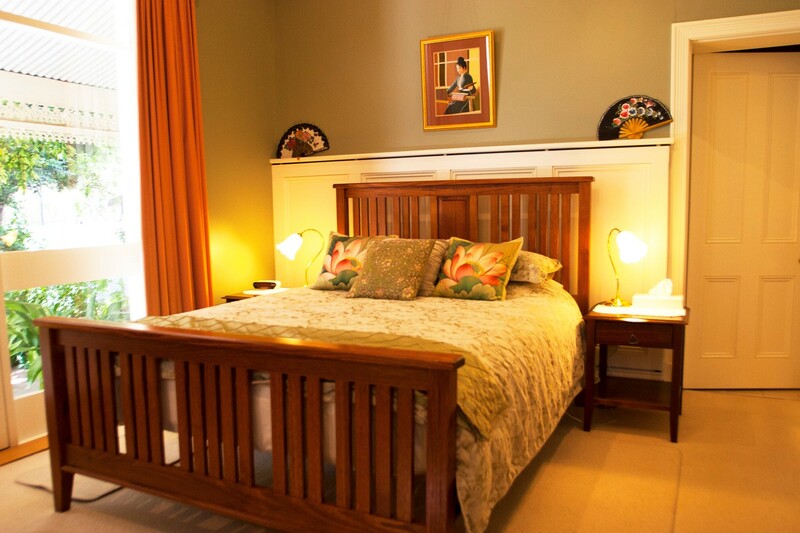 Queen bed with electric blanket in large room with alcove with refrigerator and tea and coffee making facilities. Large bathroom with overhead heating, 2 person spa, shower, toilet and vanity. Linen, towels, gowns, slippers and bathroom toiletries are provided. RC air-con and convection heater for winter months. Small lounge, table and chairs are part of living area. TV/VCR/DVD, dvds and videos, magazines and selection of reading material are supplied. A continental breakfast tray with selection of muffins, croissants and toast, jams, fruit juice, tea and coffee will be delivered to your door. Large queen bed with electric blanket for winter. Alcove with refrigerator and tea making between bedroom and large ensuite bathroom with 2 person spa , shower, toilet and vanity. Overhead heating in bathroom, R/C air-con, TV/DVD/VCR, clock radio, chairs, small table, books, magazines, dvds, videos. All linen , towels and bathroom toiletries as well as gowns and slippers are provided. Vanity with sink in bedroom as well as bathroom. Outside table and chair setting on verandah looking towards gardens. A continental breakfast tray with selection of muffins, croissants and toast, jams, fruit juice, tea and coffee will be delivered to your door. Cancellations 7 days or less from arrival date incur full payment of the quoted tariff for the booking. Any cancellation or change to a booking will incur a $30 service fee.